Coke didn't meet annual goals for growth. It should be more like Pepsi and get some snacks in the mix. NEW YORK (TheStreet) -- You can tell when an iconic brand name like Coca-Cola (KO - Get Report) is running out of great sales ideas. If one of the top headlines for the company that invented the word "Coke" reads Slumping Diet Coke Goes Slurpee, even Warren Buffett might start squirming. As a shareholder I'm glad Coca-Cola is looking for ways to extend the brand, such as selling a Diet Cherry Coke frozen beverage exclusively at 7-Eleven stores under the Slurpee brand as of Wednesday. It might add some fizz to the stock, which is down over 8% for the year to date as of the Wednesday close of $37.87. KO is down over 13% from its 52-week high partly because of the ominous guidance on its operating profit in 2014 when it released with fourth-quarter earnings last week. It also disappointed when it reported that its beverage volume rose only 1% for the quarter and 2% for the year. CEO Muhtar Kent squarely placed responsibility for the bad news on, you guessed it, the weather as well as the challenging economic conditions in the many areas of the world where it sells its beverages. Investors aren't buying it -- as in the shares. After the earnings the stock fell nearly 4% and on Feb. 20 it hit a 52-week low of $36.89. Part of the reason that the stock is languishing -- the Atlanta company isn't PepisCo ( PEP - Get Report). Pepsico has grown its product mix to the point that its snack food division outperforms its beverage segment. Recently I wrote that as a result, shares of PEP have soared while activist investors push for a shareholder-friendly spinoff of its snack food dynasty. Diversity-poor Coca-Cola still gets the vast majority of sales and earnings from selling beverages, especially the bubbly kind. In fact about 75% of its global sales volume derives from selling soda pop. That's part of the reason the company had to admit that its fourth-quarter 2013 revenue fell 3.6% to $11.04 billion. Even more distressing is Coke's net income, which plunged over 8% from the year-ago quarter to $1.7 billion. In the plus column, revenue rose 4% and operating income was reported as having risen 6%. This isn't very comforting when one considers that its international soda sales fizzled to virtually unchanged and were down 3% in North America. As we look at the five-year price chart of Coca-Cola imagine how Warren Buffett's Berkshire Hathaway (BRK.B - Get Report), which as of Dec. 31 owned over 9% of the outstanding Coke shares, must be feeling about now. By the way, 9% of the outstanding shares equals more than $16 billion worth. Since Berkshire has owned shares of Coca-Cola for many years its return on investment has been excellent, especially since 2009. 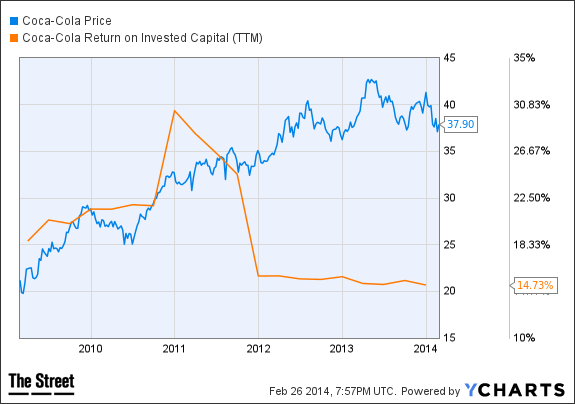 But look at that orange line, the trailing 12-month (TTM) return on invested capital. That alone would make a big investor gulp, with or without a mouthful of Diet Coke Slurpee. Among shareholders there's plenty of concern the company isn't doing enough to add products and diversify away from generating most of its sales from beverages. If it doesn't take a hint from PepisCo's playbook, the shares may have limited upside for the time being. Selling at a forward (one-year) PE of almost 17 times earnings also continues to give it the look of a stock that isn't a bargain. Add to that the limited hopes for future progress with its sales growth and the stock's estimated average one-year price target of over $43.92 (according to Yahoo! Finance) seems like a stretch. On a positive note, the biggest shareholders' patience is starting to fizzle faster than an opened can of Coke, and if an activist investor or two shakes things up a bit the upside "explosion" may be similar to shaking a bottle of Cherry Coke and suddenly popping the cap. You get the picture. At the time of publication the author had positions in KO and PEP.